Nobody loves school dances more than we do! We have a wide variety of props and backgrounds that you won't find anywhere else. Whether you want to have a formal prom or a wild-west homecoming, nobody does dances better than Magic Dance Photography. Just take a look at what we have to offer, and we're sure you'll choose us for your next dance! We will make a no-cost presentation to your committee. We have an array of backgrounds that you won't find anywhere else! 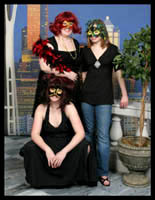 We bring a variety of props for fun poses and unforgettable group pictures! We work with your dance committee to create custom tickets and posters, made to match your theme- all for free! Many fun products like engraved keychains, memory books, and more! To find out more, contact us and schedule a visit from one of our representatives.